Singer Mariah Carey was born on March 27, 1970. She was raised on Long Island, NY and fell victim to bullying and discrimination as a child because she is bi-racial. Her mom, Patricia Carey, a former opera singer, is of Irish descent. Carey’s dad, Alfred Carey, an engineer, was African American and Venezuelan. He died of cancer in 2002. The couple split when Carey was three-years-old. She lived with her mom and moved 13 times. Her sister, Alison, lived with their father. Alison turned to drugs and prostitution and contracted HIV. They also have a brother, Morgan. Carey has been married twice. She wed music executive Tommy Mottola in 1993, but they divorced in 1998. In a whirlwind romance, Carey eloped with Nick Cannon in 2008 in the Bahamas. They renewed their vows nearly every year for their anniversary before calling it quits in 2014. They co-parent their twins, Moroccan and Monroe, who they affectionately call “Roc and Roe” and “dem babies.” Their son and daughter were born in April 2011. Carey said “Yes” to Australian billionaire James Packer, but they never made it to “I do.” The couple broke off their engagement in 2016. She’s also dated Derek Jeter, Luis Miguel, and her backup dancer Bryan Tanaka. The singer suffered an emotional and physical breakdown in 2001, which forced her to be hospitalized and cancel appearances as she sought treatment for exhaustion. In her decades-long career, Carey has released such hits as “All I Want For Christmas Is You,” “Hero,” “Touch My Body,” “Always Be My Baby,” “We Belong Together,” “Butterfly,” and so many other chart-toppers. She headlines a Las Vegas concert residency called “Mariah #1 To Infinity” at The Colosseum inside Caesars Palace and takes her show on the road when she goes on tour. Her shelves are overflowing with trophies. Carey has taken home Grammys, Billboard Music Awards, American Music Awards, World Music Awards, and more. 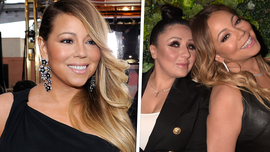 Carey gave fans a peek behind-the-scenes when her docu-series, “Mariah’s World,” premiered on E! in December 2016. She also appeared in an episode of the scripted series “Empire” and in the films “Lee Daniels’ The Butler,” “Precious: Based on the Novel ‘Push’ By Sapphire,” and “Glitter.” Following the success of her directorial debut of the Hallmark Channel original movie “A Christmas Melody,” Carey signed a deal to partner with the network on additional made for TV movies. She is also known for her fragrances. All I Want for Xmas is ... For My Twins to Nail These Backup Vocals!!! Ex-Mgr. Claims Sexual Harassment ... Singer's ALWAYS Naked! Former Manager Sues for Civil Rights Violations You Screwed Me Over!!! I Got Me A New Bev Hills Mansion!!! Mariah, Jamie and Wiz Party At Wild 41st Birthday Bash!! !